This is a very fun and easy musical instrument to make! When you blow into the open end of the toilet paper roll the sound waves hit the wax paper and make a Kazoo noise! 1. 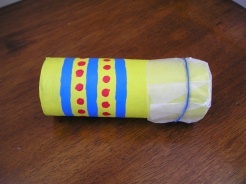 Paint your toliet paper roll any fun colors you choose! Cut a circle from a piece of wax paper, any where from 5" to 6" in diameter. 2. Once your paint is dry wrap the wax paper around one end of the toilet paper roll and secure it with a rubber band. You're ready to make some music!